We'll be covering every game for the NFL. We've also added some new features. Well what is http://www.livefanchat.com/ all about? A few of us were kicking around ideas about what was and wasn't working with Twitter and sports. 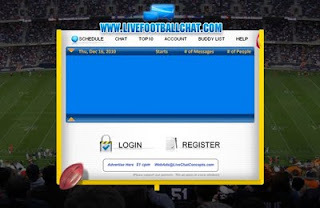 We were baseball fans that loved to chat during the MLB games but after playing with skype, irc and a few other live chat tools hadn't found an app that really worked for us. Being geeks what else could we do but sketch up some ideas and thats how http://www.livefanchat.com/ and http://www.livebaseballchat.com/ came about.